D2298 performed many of the Highbridge to Glastonbury goods workings serving the Clarks shoe factory at nearby Street after the end of steam. 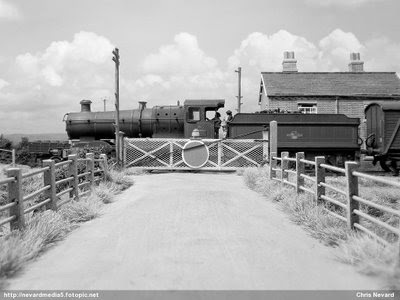 Here we see D2298, now preserved at Quainton Road clanking through Catcott with one of these trains in the late summer of 1968. Messed about today with the telegraph wires using 'Slik Worm Invisible Elastic Thread' as recommended by Graham Muz! Highly elastic, hopefully enough to survive 'spawn of chav' and elderley women who have to finger everything when on the road. Will it survive me when I get a shunting pole hooked up? We shall see, it's vvvvveeeeerrrrryyyy elastic - boiinngg! 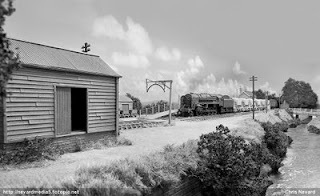 Back in the summer of '62, well known Bath based photographer Ivan Locksmith captured this unusual view of Templecombe's ex GWR 0-6-0 No. 3206, paused at Catcott Crossing picking up an empty milk churn. Few crossing keepers' cottages on 'the branch' had running water, so the churns were used to carry vital water supplies, these being delivered by the crews of passing trains. The 9F, a standard issue tender driven Hornby 'Evening Star', was inherited in 2001 after the death of a good friend. As a sort of tribute to him (he used to rebuild old cars to concourse condition, so would have appoved of the upgrade), I decided to turn the engine into a proper workhorse rather than be the rear powered bluffer the Margate factory decied it should be! 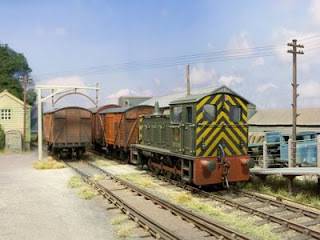 Rather than use the mint Evening Star body, at a local show I picked up a tatty 9F body and tender for a few pennies. On this one, I stripped the body and tender right back, replacing all the moulded gubbins with wire and new brass bits like handrails and brackets etc. The missing front steps were formed up from the brass sheet. The outcome looked great, but of course, being tender drive worked like a dog and jammed going thouh my bullhead pointwork on Combwich due to the Tupperware wheels on the tender drive. 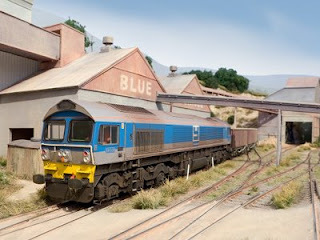 At the time (2002), which is before Bachmann bought out their gem, there is/was a business which performed loco drive conversions called 'Model...sumitorother' (cannot recall name) to new locos. I contacted them to see if they'd do me a conversion to an existing loco instead. A week or two later, a fully functioning chassis came through the post. That's about it! Of course, with this progressive upgrade, in the end, none of the original loco was touched! What could have happened? 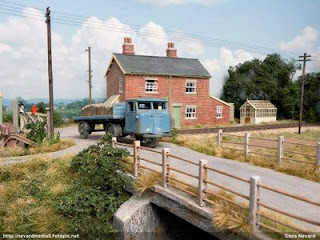 In real life, the GWR Radstock to Bristol route closed due to a landslide in the late 1960's. 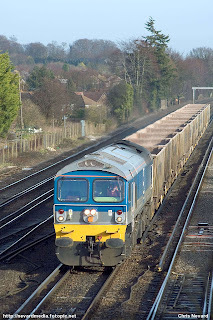 Imagine though, if the landslide had happened a few years earlier which resulted in the S&DJR from Radstock to Highbridge (with a reversal at Evercreech Junction) remaining open for coal, cement and stone traffic? We can dream! The picture. Riddles 9F 2-10-0 No. 92224 clanks through the crossing at Catcott Burtle with Cement train from Westbury to Portishead (via Frome & Radstock) on 5 September 1964. That's the fiction, in reality, the 9F started life as a Hornby 'Evening Star' which has been converted to loco drive and extensively detailed. The 'Presflo' wagons are from ancient Airfix kits. Catcott, the little 5 ft x 15 inch trainset has taken a backseat over the last week or two while the 59 took precedence. Back to the sort of modelling I'm far happier with. A look through the garage and a pack of Ratio telegraph poles were located to accompany a Wills/Ratio SR style concrete loading gauge kit put together in front of the TV last night. Looking at old pics of real railways, it's amazing just how many telegraph, electricity and telephone poles there were/are all over the place. In real life engineers spend enormous amounts of time placing these things to ensure they'll mess up that master shot, I have a little more control in my world! 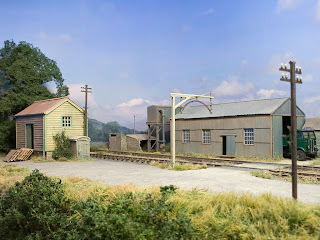 Oh yes, the little grotty sheds next to the water tank are 'Wills Grotty Sheds', also made up in front of the TV last night. OK, here we are on the other side of the operation after the front end surgery, repaint, new grills (A1 Models) and weathering . Scale couplings, cast plates (on order) and warning flashes (for front end, not sure who does those) still to be added. Here's the shopping list so far - all from http://www.mgsharp.com who are very quick! A1 Models A5900 bodyside and roof grills, etched brass. DW 290 Details West Headlight Mars Twin (for the one in the middle, the base is a tad wedge shaped, a file will sort this). I have several pictures of it (it's my favourite too), redoing those tiny stars to denote another loco would have been a pain in the whatsit. Lastly, because I didn't want to repaint the sides, hopefully the Shawplan number and name plates will hide the printed ones! Representing another loco with shorter name may not cover what's there! I'm a bodger and fan of any short cuts that can be done. Humbrol Matt 109 (blue, 95% correct, weathering masks the very slight difference). Why this colour? I just so happened to have it at home for dry brushing onto BR 'banger' Blue for that faded effect! Humbrol Matt 120 (pale green for cab interior), why this colour? Again, it was at home! It was bought to represent faded SR green (for buildings), near enough for this job. Left: 59004 powers past Worting Junction with the 7V01 Woking to Westbury empties , 13 January 2005. A bit of a change from my current historic Catcott project; on the modelling bench, a Hornby (ex Lima) Class 59, 59005 'Kenneth J Painter'. Hornby have used the body shell for the later 59/1 & 59/2 locomotives. The main difference being the incorrect lighting clusters. 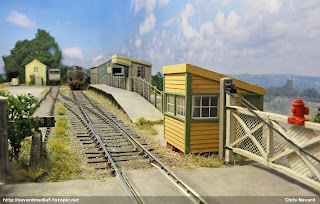 The little hut in this picture is based on the little ground frame at Ashcott & Mere between Glastonbury and Shapwick on the former Burnham on Sea branch of the former Somerset & Dorset Joint Railway. 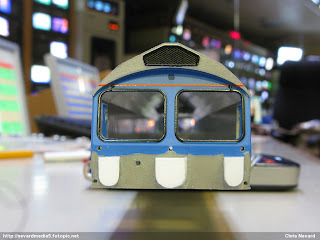 The model is made up from some plastic card and some thin strips of self adhesive labelling to replicate window frames. A splash of paint, a bit of weathering, and we have a box ready for Catcott Burtle, my current 'could have been' project in 4mm scale. 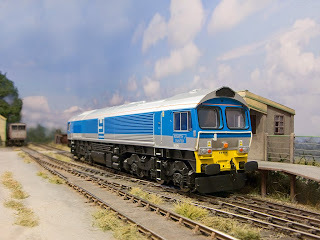 On the modelling bench, a Hornby (ex Lima) Class 59, 59005 'Kenneth J Painter'. Hornby have sadly made a hash choosing the prototype to represent, so irritatingly, I'll need to modify the lighting clusters on the front along with other general detailing. http://nevardmedia.fotopic.net/search.php?txt=59005&t=p . Luckely I won't have to disturb the blue paintwork, getting a match for that might be tricky, silver is no problem matching in though. The baffle/plough thingy in the front will need to be fixed to the body rather than bogie too - simple enough. It's either that or going for the Hanson livery, which would be correct for the Hornby body. In the end I fear that cutting up a little plastic will be easier than trying to create Hanson paint job and sort out a Hanson transfers - so 59005 it is!